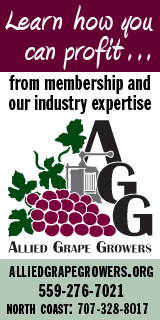 However, in the decades since the CWA was passed, the Environmental Protection Agency, which oversees the CWA laws, has written extensive regulations to interpret how it it to be regulated. In addition, the U.S. 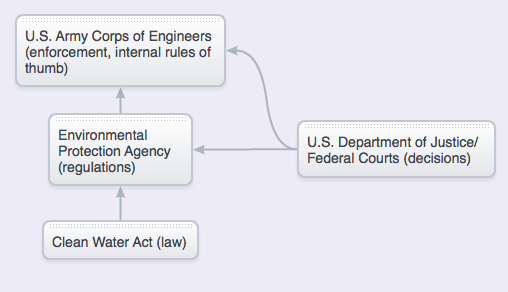 Corps of Engineers which is charged with CWA enforcement (See: Memorandum Between The Department of the Army and The Environmental Protection Agency), has developed a broadly encompassing set of standards aided by numerous court cases. Finally, the language and decisions in court cases have been adopted by the EPA in updated versions of regulations. This evolutionary feedback loop has resulted in the evolution of all of the interactive parts of CWA enforcement. The Clean Water Act prohibits the discharge of pollutants into navigable waters or other WOTUS without a permit from the Corps of Engineers. In other words, discharging a certain amount amount of pollution is allowable if a permit is obtained in advance. Certain exemptions also exist for agriculture. In general, the CWA focuses on “point sources” such as pipes, smokestacks, dredge piles, waste dumps and similar origins. Significantly, a number of prominent federal court cases have found that in certain fairly common circumstances, regular soil which contains no pollutants, can become a pollutant when plowed. Those cases have also determined that a plow can serve as a point source of pollution. If the Corps of Engineers finds that a party has violated the CWA or the EPA regulations, it often issues a compliance demand or a cease and desist order. If that does not resolve the issue, the Corps may the violations to the U.S. Department of Justice, which is responsible for filing suit in the relevant U.S. District Court. The complete EPA/Corps policy on how to treat violations can be found EPA/Corps Enforcement Priorities Guidance (PDF). This is the currently operative document according to: EPA CWA Section 404 Enforcement Overview. It is important to keep in mind that, while many CWA legal actions have involved wetlands, federal jurisdictions extend to all Waters of the United States regardless of land use: farm fields, vineyards, municipal parks, residential property, commercial property — any area the EPA and/or Corps of Engineers determines as WOTUS. Finally, in enforcing the statutes, there is no legal or regulatory requirement that the EPA or Corps of Engineers prove or quantify any specific or tangible actual harm to water or the environment before taking action against a landowner or farmer. As described above, the Clean Water ACT is the original legislation. Enforcement and regulation of the Act have developed over the intervening decades into obscure and often inconsistent policies. The EPA and its supporters said the Rule was an effort to consolidate into one single document, a wide variety of policies and legal precedents that had accumulated since the Clean Water Act was passed in 1972. In creating the RULE, the EPA acknowledged that the plethora of various doctrines and rulings had made it confusing for landowners seeking compliance guidance. That is why, in 2015, the EPA developed the Clean Water RULE which assembled mostly existing practices of the EPA and Corps enforcement policies and legal interpretations into a single, comprehensive documents. Opponents of the Rule, on the other hand, charged that the Rule extended federal powers, was a regulatory over-reach, and not consistent with the intent of the statute passed by Congress. The assembly of existing practices into a single document also focused attention on the extent of the EPA’s and Corps’s existing reach and power. That provoked an outcry among some lawmakers, farming groups, and property owners. As a result, lawsuits that a suspension of the Rule in 2015. It’s also notable that many environmental groups opposed the new Rule as too weak. In 2017, President Donald Trump moved to abolish the Rule. A series of court decisions — including several from the U.S. Supreme Court — have greatly extended the jurisdiction of WOTUS to places that are not visibly wet. These include streams or other topographical features distant from traditionally navigable waters. These distant areas may be seasonally, intermittently, or rarely wet. Jurisdiction is extended to these areas because there may be some connection to a navigable body of water. The extension of federal jurisdiction to these areas is derived from the “Nexus rule” that comes from a concurring Supreme Court opinion written by Mr. Justice Kennedy in the case of Rapanos v. United States. The rationale for nexus lies in the logic that pollution from land that has no visible flowing stream or other direct connection to navigable waters can — through rainfall runoff — indirectly reach a body of water that is under the jurisdiction of the EPA and/or Corps of Engineers. The obvious example of the logical application of this concept would be a chemical spill which flows downhill and reaches a jurisdictional stream. In this context, nexus makes it obvious that preventing the pollution of a jurisdictional body of water requires that the CWA be extended beyond traditionally navigable waters. NOTE: The “Clean Water Rule” regulation has been suspended due to legal action. However, this graphic and other discussions remain important because the suspended rules reflect currently established and ongoing EPA/Corps determinations and enforcement. Nexus is not mentioned or defined in the Clean Water Act law. As described, above, it has come about as part of the organizational evolution of regulations, enforcement and court decisions. The most recent federal court interpretation of nexus comes from an ongoing Northern California case concerning a Tehama County wheat farm. In that decision, (Duarte v. U.S. Army Corps of Engineers) the judge defined nexus according to her understanding of the splintered decision in Rapanos v. United States. The Rapanos decision is described below as a “4-4-1 plurality opinion.” That means four justices agreed with the court’s ultimate decision and four disagreed. The “concurence” opinion written by Justice Kennedy was the tie-breaker. His concurrence meant that he agreed on the ultimate decision, but not for the same reasons as the other four justices. An excerpt from the decision in Duarte is presented below in its entirety, including citations as they appear in her decision.The excerpts are unedited except for adding line breaks for improved readability. Several significant phrases are bolded, italic for emphasis. While a majority of the Supreme Court has yet to agree on an explanation of when wetlands are sufficiently adjacent to navigable waters to confer CWA protection, the narrowest grounds of agreement among members of the Court were established in Rapanos v. United States 547 U.S. 715 (2006). In Rapanos, a 4-4-1 plurality opinion, the Supreme Court considered the definition of “navigable waters” under the CWA. Justice Kennedy, casting the fifth vote for reversal along with four other Justices, concurred only in the judgment. His concurrence provides the narrowest ground on which a majority of Justices would agree if required to choose, in almost all cases. See N. Cal. River Watch v. City of Healdsburg, 496 F.3d 993, 999 (2007) (“to qualify as a regulable water under the CWA, the body of water itself need not be continuously flowing, but that there must be a “significant nexus” to a waterway that is in fact navigable.”). [A] “mere hydrologic connection should not suffice in all cases; the connection may be too insubstantial for the hydrologic linkage to establish the required nexus with navigable waters as traditionally understood.” Rather, the “required nexus must be assessed in terms of the statute’s goals and purposes,” which are to “restore and maintain the chemical, physical, and biological integrity of the Nation’s waters.” City of Healdsburg, 496 F.3d at 1000 (citing Rapanos, 547 U.S. at 784–85; citations omitted). The Ninth Circuit directs courts deciding whether there is a hydrological linkage to look for a “reasonable inference of ecological interconnection.” Id. A “significant nexus” exists where wetlands have a significant effect on the chemical, physical, and biological integrity of the nearby navigable waters. 496 F.3d at 1001. Below is Justice Kennedy’s full concurring statement in Rapanos v. United States. The portions that are in plain text (not bold italic) offer significant context to the excerpts chosen by the Judge. The required nexus must be assessed in terms of the statute’s goals and purposes. 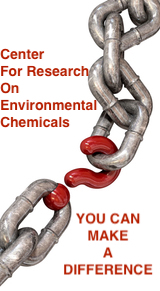 Congress enacted the law to “restore and maintain the chemical, physical, and biological integrity of the Nation’s waters,” 33 U. S. C. §1251(a), and it pursued that objective by restricting dumping and filling in “navigable waters,” §§1311(a), 1362(12). With respect to wetlands, the rationale for Clean Water Act regulation is, as the Corps has recognized, that wetlands can perform critical functions related to the integrity of other waters—functions such as pollutant trapping, flood control, and runoff storage. 33 CFR §320.4(b)(2). Accordingly, wetlands possess the requisite nexus, and thus come within the statutory phrase navigable waters, if the wetlands, either alone or in combination with similarly situated lands in the region, significantly affect the chemical, physical, and biological integrity of other covered waters more readily understood as navigable. When, in contrast, wetlands’ effects on water quality are speculative or insubstantial, they fall outside the zone fairly encompassed by the statutory term navigable waters. Kennedy agreed that occasionally wet areas meeting those Corps standards are jurisdictional Waters of the United States. Contrary to the plurality’s description, ante, at 2–3, 15, wetlands are not simply moist patches of earth. They are defined as “those areas that are inundated or saturated by surface or ground water at a frequency and duration sufficient to support, and that under normal circumstances do support, a prevalence of vegetation typically adapted for life in saturated soil conditions. Wetlands generally include swamps, marshes, bogs, and similar areas.” §328.3(b). (3) wetland hydrology, a term generally requiring continuous inundation or saturation to the surface during at least five percent of the growing season in most years. See Wetlands Research Program Technical Report Y–87–1 (on-line edition), pp. 12–34 (Jan. 1987), http://www.saj.usace.army.mil/permit/documents/87manual.pdf (all Internet material as visited June 16, 2006, and available in Clerk of Court’s case file). Under the Corps’ regulations, wetlands are adjacent to tributaries, and thus covered by the Act, even if they are “separated from other waters of the United States by man-made dikes or barriers, natural river berms, beach dunes and the like.” §328.3(c). The general practice of the EPA and Corps of Engineers has been to define a “tributary” as any stream-like feature that has a bed, bank and ordinary high water mark (OHWM). Minimum dimensions of the width of the bed, depth of the bank, or level of the high water mark have not been specified. As a result, the categorization of whether a feature is a tributary or not is made on a case-by-case basis. The lack of a specific size or standards has caused concern, especially among farmers. In 2015, the EPA issued a new set of CWA regulations — known as the Clean Water Rule. In that rule, the regulations finally the bed, bank and OHWM requirements, failed to delineate any minimum dimensions that would provide a threshold for including or excluding inclusion in WOTUS. 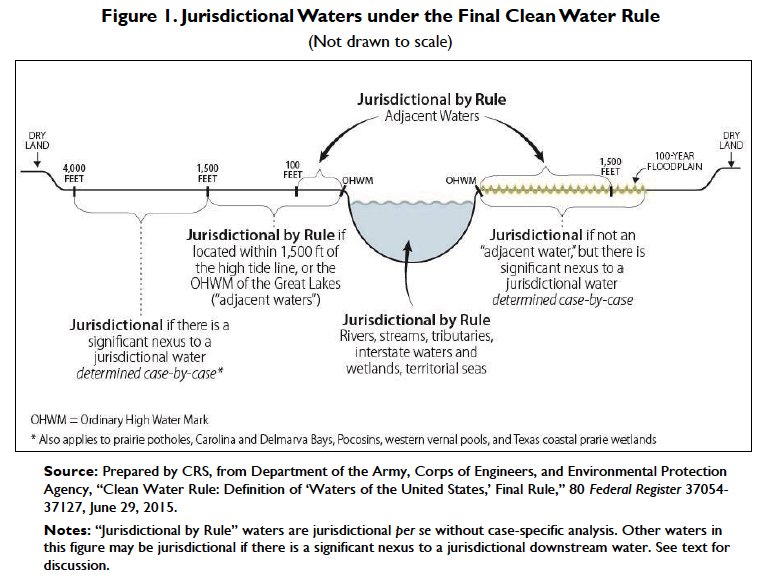 While the logic for the Clean Water Rule was to provide more certainty about which land could be under WOTUS jurisdiction, it failed to be specific in this instance. Compounding the confusion was the Rule determination that “erosional features” would not be regulated. But, in failing to specify width, depth and size of OHWM, the rule did not define the difference between a tributary and an erosional feature. The new rules (including the tributary definition) met with widespread opposition and lawsuits with the result that court action prevented their implementation. This link — Clean Water Rule Stayed Nationwide — offers a periodically updated time line of the court actions. Left without specific benchmarks, the jurisdictional status of many land areas must still be decided on an ad hoc basis. How does soil become a pollutant? And a plow a “point source” of pollution? Army Corps of Engineers v. Hawkes Co.